The iconic visitor center from the Spielberg film Jurassic Park is one of the first things guests will see across the lagoon after walking through the Port of Entry. The amount of space within Jurassic Park is deceptively large, and the entire area is completely immersive as you walk through it (except where Harry Potter’s Hogwarts intrusively pokes above the trees). There are two main entrances into this island, one coming from Toon Lagoon and another from The Wizarding World of Harry Potter. A third way in is the bridge between Lost Continent and Jurassic Park, which allows guests to bypass Hogsmeade on busy days. 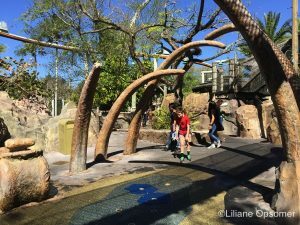 Camp Jurassic is the most elaborate kid’s play area at Universal—and one of the best theme park playgrounds you’ll find anywhere. A sort of dinosaur-themed Tom Sawyer Island (minus the rafts), it allows kids to explore lava pits, caves, mines, and a rain forest. Explore and you’ll find an echo cavern, bat caves, amber-bound bugs, and dilophosaurus heads that double as water blasters. The playground is big enough for many kids to spend a solid hour just running around. You may end up having to go into Camp Jurassic just to get the little nippers out, if you can find them. One of IOA’s original headliner attractions, Jurassic Park River Adventure is inspired by a scene in Michael Crichton’s original Jurassic Park novel. Guests board tour boats for an aquatic ride through the grounds of Jurassic Park. Everything is tranquil as the tour begins and the boat floats among large herbivorous dinosaurs, such as ultrasaurus and stegosaurus, along with prehistoric-looking plants and the occasional geyser. 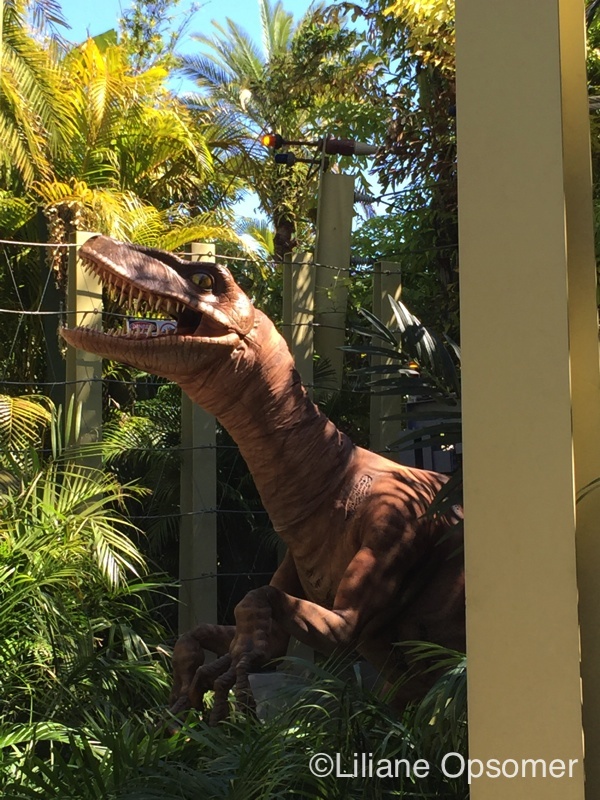 To no one’s surprise, something goes horribly wrong, and your tour boat is nudged off course by a dinosaur at exactly the most inopportune time: just as you’re floating past the vicious raptor enclosure, the gates of which have been mysteriously unlocked and left open. Before you have time to ask what OSHA’s inspectors really do during the day, your boat is climbing through the inside of the raptor facility amid the destruction and carnage wrought by the escaped animals. Your first face-to-face encounter with a T. Rex is also your last, as you find rescue by plunging 85 feet (the tallest such drop in Florida and a world record when it was built) into the river below. 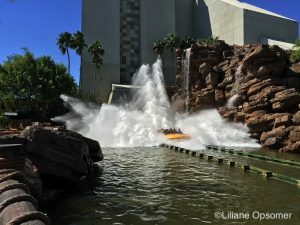 The drop is a doozy; the scenery, background music, and ride narration are all done well; and Jurassic Park River Adventure is overall one of the more immersive attractions in the entire resort. But the dinosaurs are fewer in number than at this ride’s California cousin, and those it has look increasingly arthritic, despite a 2015 refurbishment of their faded rubber skins. 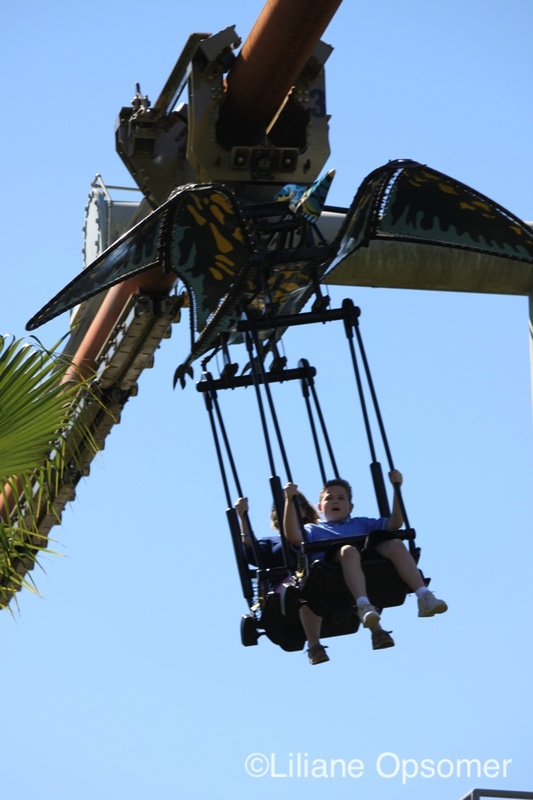 Pteranodon Flyers: This is Islands of Adventure’s biggest blunder. Engineered to accommodate only 170 persons per hour, the ride dangles you on a swing below a track that passes over a small part of Jurassic Park. We recommend skipping this one. Why? Because the next ice age will probably end before you reach the front of the line! And your reward for all that waiting? A 1-minute-and-15-second ride. However, young children love it! 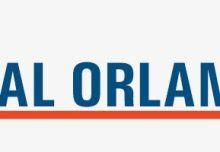 This interactive educational exhibit mixes fiction from the movie Jurassic Park, such as using fossil DNA to bring dinosaurs to life, with skeletal remains and other paleontological displays. The best exhibit here lets guests watch an animatronic raptor being hatched, with a young witness getting to name the newborn. You never know quite when one will emerge, but ask an attendant if you should stick around. Other exhibits allow you to digitally “fuse” your DNA with a dinosaur’s to see what the resultant creature would look like, play a cheesy game show with dino trivia, or “be a saurus” by seeing through the eyes of one of the life-size animatronic ones (if they happen to be working). Just when everyone thinks that Disney has a lock on the meet-and-greet market, between its talking Mickeys and Frozen sisters, Universal does the impossible—breeds a live velociraptor and makes it pose for pictures! OK, it isn’t actually a real dinosaur on display, but you’ll find it just outside the Jurassic Park Discovery Center, inside a portion of the long-closed Triceratops Encounter walk-through attraction. 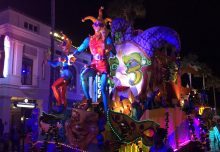 In fact, it’s an amazingly realistic puppet, created by Michael Curry (who built designs for Disney’s The Lion King and Finding Nemo musicals, as well as Diagon Alley’s Tales of Beedle the Bard show) and brought to life by talented performers. In his book The Unofficial Guide to Universal Orlando, author Seth Kubersky shares descriptions of all rides at Universal Orlando.